Ngepi Camp is situated on a flood-plain island on the unspoilt banks of the Kavango River IN the Okavango Delta panhandle in Namibia. 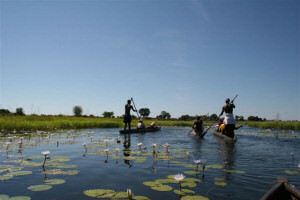 It is 14 k’s south of Divundu and only 3k’s from the Mahango Game reserve and directly across the river from Bwabwata National Park (Buffalo Core Area) The area is also known as the Caprivi Strip. 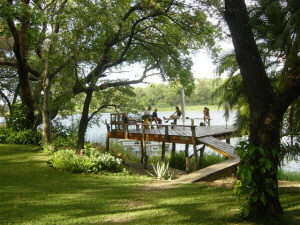 The camp has permanent river frontage and is surrounded by seasonally flooded swamp. It’s an exceptional paradise teeming with bird and wildlife and has fast become a haven to many travellers, either passing by, or as a destination. The accommodation at Ngepi is varied, there are 13 lovely campsites alongside the river, with a further 3 set back into the bush; they all have water, braii facilities, a power point, and are beneath huge trees for shade. There are other separate camping areas for the larger groups, & overland trucks. Families can be accommodated in 3 bush huts, which have en-suite facilities, and each sleep four people in one double bed room, and a twin bedded room. The 12 tree houses, each sleeping two, are ingeniously built on raised platforms, around large trees, are en-suite and have great views. All the accommodation and camping facilities, have hot funky showers in fun ablutions. Ngepi has a lively bush pub - a great place to meet fellow explorers, share stories, and enjoy the friendly atmosphere with a cold beer! On some evenings guests can join in a cultural drumming dance party. 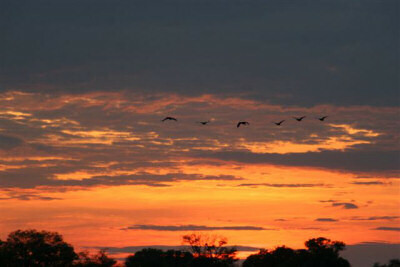 Bird life in the area is prolific, with a species count of over 500. A wooden deck overlooks the river – the ideal spot to see the sunrise and sunset, bird watch and game view, whilst the serenades of hippo and fish eagle fill the air and clean Kalahari air fills the lungs. There is a safe unique floating swimming pool that offers a new slant on ‘cage diving’! Ngepi offers a number of activities. A guided drive to Mahango Game Park or the Bwabwata National Park (Buffalo Core Area) area across the river, promises sightings of elephant, lion, buffalo and plains game, including the worlds largest herds of sable and roan antelope. 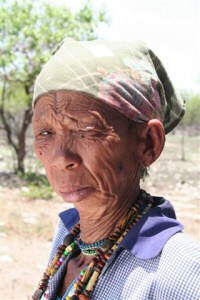 A day trip to see Bushman art at the Tsodilo Hills in Botswana. 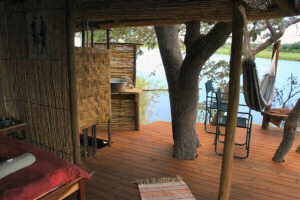 Ngepi Camp has a strong environmental policy, and they encourage guests to get involved. Visitors can interface with the local San Bushmen and Humbukushu people so as to promote understanding of their symbiosis with the environment. Ngepi constructively supports them towards a sustainable future. Hot water supply is now totally solar and Mark is busy building and setting up the next stage which is having the camp totally run by solar power. This is an expensive exercise, but worth every cent as it will make the camp completely independent of the generator and therefore save many hundreds of litres of diesel per month. Their indigenous tree nursery gives trees to anyone who would like to take them to plant. The important thing is that they must NOT be sold, but given away. Ngepi Camp certainly is full of surprises and a stop of several days should be planned. Ngepi Camp is located 14km from Divundu, which is a small settlement on the B8 road between Rundu (200km) and Katima Mulilo (320km). At the T-junction in Divundu, turn onto the D3403 to Mahango Park and Mohembo border post, 10km along this road you will see the sign for Ngepi Camp on the left hand side, from the turn off it is a further 4km. If you are coming from Botswana you enter Namibia at Mohembo Border Post and continue driving straight through Mahango Park. When you exit the park gate, it is a further 9km until you reach the turn-off to Ngepi on the right hand side, from where it is another 4km. 2-wheel drive access is possible, as a raised road has been constructed over the flood plain near the camp. Fly-in’s can use the nearby Bagani Airfield (GPS coordinates S18 07’06; E 21 37’41. Hard gravel surface 1100 metres) or the airstrip at Shakawe (coordinates .S18 22.004 E 021 48.99 Tar +- 1200m) where immigration will meet you with priour arrangement. Imagine a place so remote, that it has been preserved untouched. Born on a whim of enjoyment, Ngepi camp started out life to allow others to enjoy the environment, and get real value from it, as I had done on my ‘walkabout’ of 6 months in search of myself. I came here 19 years ago during the war torn years of apartheid, and found this piece of Africa to be completely untouched, and amazingly, somehow, despite the lack of western influence, it existed quite fine, thank you. Today, we are fighting to keep it that way – with difficulty, I may add, as ‘progress’ is eating away at its soul, and bringing that inevitable change that we all unwittingly strive to introduce….. for the benefit of the locals, you understand!! Ngepi is beautiful, pristine and in balance, and we all love it. What is scary, is that the truth of it is, that it is this way because we have NOT interfered with it! About 6 years ago I was called to a meeting at which the community were attempting to evict a manager of mine who had misbehaved. I attempted to reason with the assembled crowd, that if they deported my manager, as they intended, it would impact on them directly, as I would be forced to close Ngepi and they would be without the income and benefits they enjoyed from it. Ngepi was basically the only real contributor to the economy in the area, and employed more than 80 people in one way or another. By my reckoning, this fed and housed 10 times this number and many kids benefited as they went to school and would be able to integrate into the modern world, and be uplifted thereby. I gave it my best shot, and was quite convinced that even the ‘enemy’ would see reason, as I had left them little choice in the consequence of their actions. The community voted my manager should leave the Country within one day, to which I responded that I would go and see my mate the Governor, and any other responsible person I could, and get this insanity stopped immediately. I succeeded, and life went on, with a small rift, which I ignored, as I definitely was above all this. I did however think about it, and as the years passed, I learnt a little wisdom, and realized more and more that the old man was right. The more I saw how we (us Westerner Capitalists) managed to destroy most things in our path in the name of development and progress, the more that steely look the old man gave me, haunted my soul. Here I was trying to sell ‘bums in beds’ at Ngepi so that I could make an extra buck, while enjoying this amazing ‘in balance’ place, without any clear understanding as to why it existed, and what I was unwittingly doing to change it forever. This amazing place’s only salvation is if we leave right now ….. or wake up and DON’T do what we normally do, in an undeveloped place like this. All this talk comes down to the fact that these people deserve common respect, like all of us, which they don’t get, because they are perceived as poor – mainly due to the inability of the West to see any value in the way they live, or for their value system. We therefore propose a ‘conservancy’, where this rural African can live in peace, with the respect and the dignity he has deservedly enjoyed throughout history. This pristine area will no doubt be ‘developed’ by Westerners, or Africans with Western values, who see the resources available as ‘untapped’, and sprout all sorts of stuff about how the reaping of these resources will benefit the locals. We know from stats, that this monetary spin-off value is around 5% to the community, but we are saying that any direct payment to them, will change these rural people for the worse, forever – just look around without western rose coloured glasses! The developer, to be able to justify his control of the resources, has no other argument than to say, that they are going to benefit the locals, by give him employment and unending other benefits – by uplifting them! How arrogant is that? This is probably not stoppable, but it certainly could be limited, or controlled, by a proviso of “don’t spoil the culture and habitat of the local indigenous people.” This could be achieved by bringing the community into the decision making process throughout, and actually listening and actualizing their quiet advice, instead of imposing our ‘wisdom’….. Although many will hate this idea, it is suggested that the rural people’s conservation area be protected from the ‘do gooder’s sympathy’ – which, unchecked, would undoubtedly lead to the slippery slope of oblivion, in a place where the culture would be lost to the ‘dog eat dog’ culture of the west - (read cloning). Instead, some of the money that is earned from concessions could be used to educate the Foreigner who comes in and says “shame, they are poor”, by putting up education centers conveying the message of, “we are not poor, and we would like you to respect our culture for what it is – please only leave your footprints …. in the sand”. A local craft shop could obviously be attached. It would seem that Mr. Geldof and the G8 are confused as to who the poor really are. I.E. there are natural disasters effecting people all over the world, that require our immediate and temporary assistance, but living on less than one $ a day does not make a man poor, it only makes him free of our capitalist system, and we should consider if he is not actually richer in many ways than we are for it. A good example of sympathy going wrong, is Ethiopia, where after 25 years, people are still living on handouts, where previously they were able to sustain themselves perfectly well before the drought, but now don’t plant crops, as they don’t have to. The truth is, that if I had a rich father, I would definitely be lying on a sunny beach right now with my surfboard and a Martini, instead of working 24/7. Yes there is a balance somewhere, but we need to re-look at the damage our misguided sympathy & insatiable drive for development causes. Some income from the resources of the conservancy can therefore be used for the good cause of sustaining the peoples dignity - sounds clean, but it must be remembered that to achieve this, it will be necessary to keep the developers in check. Could we not put our arrogance away, and take a lesson from the Bushman who can advise us better when it comes to the environment and the animals? It should not be too surprising then, that some of the income from donors, resources or entrance fees should go to Government in the form of taxes, so that there would not be the temptation to sell the right of the land to less scrupulous developers. Details of Ngepi’s cultural & environmental joint community projects. No wood is cut or used from the camp or surrounds – fire wood comes from 4km away, where dead trees are in abundance – local project. Water comes from and returns to the river – clean. Planting trees in collaboration with the Frans Dimbare Youth group in areas where people pressure has denuded the forests. Traditional story telling to maintain culture and understanding. Wildlife & environmental educational trips to the National Parks and to Ngepi for the local school children. Support workshops for youth group’s cultural & environmental studies. 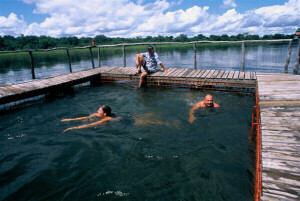 Joint Venture tourism development with community. Fiberglass Mokoro/Watu training project for canoe safari guides. Guide training, facilitating & financing. Local/tourist drumming and dancing get together venue. Community run guard project, & disaster fund for community. Employee problem solving using traditional community structures. Ngepi itself is an environmental education. - if we don’t look after today, then there will be no tomorrow. Also, a suggestion is that we would be prepared to pay for any animals that are legitimately hunted by the bushman, but only if they are allowed to hunt for sustenance as free spirits within the National Parks and other open areas, as they used to. Obviously, before it is put in motion, this suggestion will require vetting of the Bushmen clans with some rules and monitoring.